On Saturday evening, March 8, 2014, over 300 people (mainly women of all ages, some men and a few children) attended the 6th annual International Women’s Day event held in the auditorium and foyer of Library and Archives Canada at 395 Wellington. With a theme inspired by The Hunger Games books and movies, the free and fun event was co-hosted by CBC’s Lucy van Oldenbarneveld (in English) and WUSC’s Alexandra Baril (in French). It featured a Feminist Activism Fair, a short cross-country video of feminist champions, a “What the F!” skit to review the feminist year, and the 2014 Femmy Awards. Claudette Commanda (Executive Director of The First Nations Confederacy of Cultural Education Centres and part-time professor at the Institute of Women’s Studies and the Aboriginal Studies Program at the University of Ottawa)gave the traditional opening and welcomed guests to the unceded Algonquin territory. As well as free child care, the event generously offered a wide array of delicious sweet and savoury refreshments (some provided by Thyme & Again), beverages, and a cash bar. Music was provided by DJ Jas Nasty and DJ Daisy. CFUW (National) partnered with Amnesty International Canada, Inter Pares, Ottawa Coalition to End Violence Against Women (OCTEVAW), Oxfam Canada, Planned Parenthood Ottawa, Women’s Legal Education and Action Fund (LEAF), and World University Service of Canada (WUSC) toorganize the event. Additional sponsors included the CBC, Canadian Union of Public Employees (CUPE), MATCH International Women’s Fund, Nobel Women’s Initiative, and Suzy Q Donuts. The 2014 Femmy Awards honoured four local individuals and one organization for their contributions to women’s equality: Dillon Black, Marian De Vries, Denise Jessica Freedman, Hollaback! Ottawa, and Diane McIntyre. CFUW-Ottawa members Mary Butterill, Nancy DeVillers, and Charlotte Rigby helped Tara Fischer, CFUW Advocacy Coordinator, and Janice Pillon, CFUW Membership Services, at the Feminist Activism Fair, answering questions, taking photos, and handing out promotional material. New at the Fair this year was a concerted effort by participating organizations to engage with attendees on feminist issues. 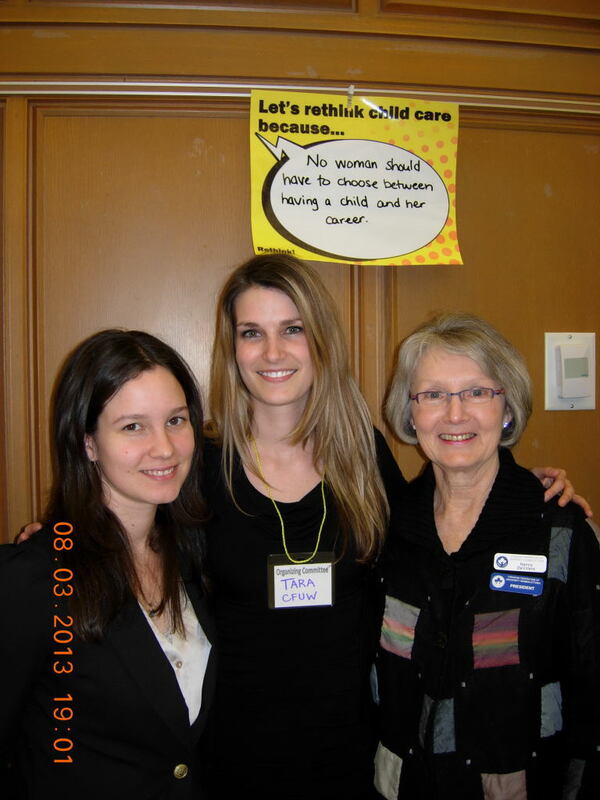 In keeping, CFUW highlighted and encouraged dialogue on publicly funded child care. Child care outside the home became an issue in Canada in the 1960s. The 1970 Royal Commission on the Status of Women recommended a public program to encourage greater gender equality. Since 1972, CFUW has adopted several policies in support of affordable, accessible, quality child care and early learning. Proponents of publicly funded child care such as Quebec’s seven-dollar-a-day program, claim that the resultant increase of women in the work force increases the income and consumption taxes collected in government coffers and strengthens the economy. As well, studies indicate improved educational, health, and social outcomes for children in such programs. This entry was posted in Uncategorized and tagged International Women's Day on March 10, 2014 by cfuwadvocacy. This March, Oxfam Canada is celebrating inspiring women who achieve against the odds. Women like Dr. Bogalech Gebre, who helps other Ethiopian women access health care, avoid female genital mutilation, and protect their daughters from bride abduction. Or Jeannette Urquilla, whose organization helped lead the campaign to push for a law against femicide in El Salvador. Or Rosaline Presence, who helps monitor and change the abysmal living conditions that have become the standard for far too many female farm workers in her country. Let’s make sure that this celebration of a century of women’s achievement doesn’t pass unobserved. We want you to help us mark 100 years of International Women’s Day by writing a letter to the editor of your local newspaper. What we might celebrate on International Women’s Day in the next 100 years. Click here to send your International Women’s Day letter to the editor. This entry was posted in Actions and tagged celebrate, International Women's Day, letters on March 2, 2011 by cfuwadvocacy.